That's the title of a 2005 book by Noah Feldman, Divided by God: America's Church-State Problem — and What We Should Do About It. Inspired by Adam Miller's chapter-by-chapter discussion at T&S of Jim Faulconer's recent book Faith, Philosophy, Scripture, I am going to try a similar series with Divided by God. Feldman is a law professor at Harvard; the book is largely a historical review of the emergence and evolution of church-state law in the United States. That history and the present state of church-state law is often misrepresented, so this seems like a helpful discussion. Here is a second post (see No. 1) drawn from Stephen Prothero's God Is Not One (HarperOne, 2010). In Chapter 7, titled Judaism: The Way of Exile and Return, Prothero comments on how ritual and ethics receive greater emphasis in Judaism and doctrine receives less emphasis than in, for example, Christianity. I wonder to what extent this is also true of Mormonism. I've been reading Stephen Prothero's new book, God Is Not One: The Eight Rival Religions That Run the World -- and Why Their Differences Matter (HarperOne, 2010). I'm rather enjoying it, which is a bit of a surprise given that I'm not generally a religions of the world kind of guy. Anyway, Prothero devoted a generous two pages in his 34-page chapter on Christianity to Mormonism and said some refreshingly pleasant things about us. The main gate at Auschwitz, through which two million victims passed. We heard a lot about the Great Plan of Happiness last weekend. What about the Great Plan of Misery? Or, in the classical formulation of the problem of evil, what accounts for the existence of evil in a Universe governed by a benevolent God? You will learn plenty about philosophy's struggle with this problem in Susan Neiman's Evil in Modern Thought: An Alternative History of Philosphy (Princeton Univ. Press, 2002). Her discussion of the philosphical problem is framed by two events that overwhelmed the moral apparatus of their respective eras: the Lisbon Earthquake of 1755 and the 20th century's Auschwitz. I can't possibly do this dense and illuminating book justice in a short blog post, but I'll certainly recommend it to the philosophically inclined reader. I just finished The War of the World: Twentieth-Century Conflict and the Descent of the West (Penguin, 2006), an 800-page tome by Niall Ferguson, the Lawrence A. Tisch Professor of History at Harvard and a Senior Fellow of the Hoover Institution. [Tisch and Hoover, an interesting pair of sponsors.] Ferguson recounts the violent first half of the 20th century with reference to nations (in the classical sense of "peoples" or, more modernly, ethnic groups) rather than states, but doesn't leave much hope for improvement as we move through the first half of the 21st century. I'll throw out a lifeline [hint: religion] in the closing paragraph. I stumbled across Crunchy Cons: How Birkenstocked Burkeans, gun-loving organic gardeners, evangelical free-range farmers, hip homeschooling mamas, right-wing natrue lovers, and their diverse tribe of countercultural conservatives plan to save America (or at least the Republican Party) at the local library a couple of weeks ago and couldn't resist. Any book with a subtitle that long must be worth reading. I don't mind being a conservative but I'm not especially keen on being crunchy, so before long I was quietly and defensively computing my own crunchy quotient. I recently read The Essential Difference: The Truth About the Male and Female Brain (Basic Books, 2003) by Simon Baron-Cohen, professor of psychiatry at Cambridge University. Anyone interested in the source and nature of gender differences (i.e., everyone) will find this an interesting book, and people with an interest in understanding autism are particularly encouraged to find a copy and read it. It's fun to see the world so keyed up about ... a book. Not a TV show finale or an election or an overhyped movie release, but a book. And the whole Harry Potter franchise is, once again, an illustration of the fact that what looks so natural, so preordained, in retrospect was, in fact, utterly improbable and unforeseeable before the fact. Take a quick look at J.K. Rowling's Wikipedia entry. The manuscript of the first Harry Potter novel was rejected by twelve publishing houses. When a small publishing house did pick up the rights to the book (largely because the CEO's 8-year-old daughter demanded the next chapter after test-reading Chapter One) the editor advised Rowling to get a day job because she'd never make any money writing children's books. Ah, sweet irony. Well I've milked Dutchergate for all it's worth — now back to our regularly scheduled blogging. 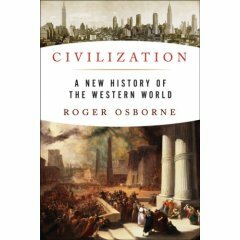 First up: Civilization: A New History of the Western World (2006), by Roger Osborne, an Englishman. That's all you need to know. Not much of a cuisine, but England can do history. I can't really summarize anything as sweeping as the history of the western world in one humble blog post, but I'll try and highlight a few of the interesting events and themes Osborne covers. My post is a mix of summary and reader response, so if you really want the story as told by Osborne, buy the book. I'll also note five or six of the more intriguing references from the bibliography, mostly for my own benefit in case my reading queue ever dries up. I'm about halfway through Francis Collins' The Language of God: A Scientist Presents Evidence For Belief (2006). Collins is a brilliant geneticist who is also the head of the Human Genome Project. I checked the book out from the local library about six months ago but couldn't get into it at all. This time I'm actually listening to the CD version during the daily commute so there's nowhere to hide, and I'm enjoying it much more than I would have anticipated. Maybe God's Universe got me warmed up to scientific apologetics. Anyway, I'd like to share a choice quote that Collins offers from the sophisticated St. Augustine. I plunked down $25 for an opening-day copy of Hugh Hewitt's A Mormon in the White House? 10 Things Every American Should Know About Mitt Romney. You can get it at Amazon for $18. I have no doubt it will be about ten times as insightful and relevant as the usual vapid campaign-year political biography. In the Introduction, Hewitt expresses his hope that, if Romney doesn't manage to get the nomination or the office, it's for policy stands or candidate gaffes but NOT because of his religion. At the same time, it's clear Hewitt, a 99.44% pure conservative, thinks Romney is a true conservative and has what it takes to sit in the big chair. Just finished God's Universe, a short book by Owen Gingerich, a noted Harvard astronomer. The book reprints the author's three lectures at the William Belden Noble Lectures, an annual event at which a noted scientist or public intellectual addresses Christian issues of the day. The book is much like the recent Francis Collins book The Language of God, except that it is much shorter and it is written by an astronomer rather than a biologist. I listened to Team of Rivals: The Political Genius of Abraham Lincoln on CD last month, then followed it up by reading a short biography of Lincoln from the Penguin Lives series. [Remini's biography of Joseph Smith is in the same Penguin series of short biographies by notable authors.] It's worth a little reading to get a handle on what life was like in antebellum America, the world of early LDS history. And it's hard to read about young Abraham Lincoln in Illinois without reflecting on what else was going on there contemporaneously. I'm halfway through The American West: A New Interpretive History (2000), an award-winning retelling of how the West was won. Hint: it's not a pretty picture. While Mormon pioneers get mentioned briefly, the book is more valuable (to the LDS reader) as a summary of just how violent and unfriendly 19th-century America was to those who weren't white and Protestant. It wasn't just the Mormons that got the short end of the stick. But in this post I'll focus on the concept of Mormons as a frontier people. In what way are the Mormons a frontier people, you ask? Get Religion posted "Covering Shallow Arguments," a short post on Letter to a Christian Nation, the new Sam Harris book. The title to the GR post says it all. It discusses this review of the new book from the Washington Post. No one seems too impressed with Harris, except for the fact that his books are bestsellers. Go figure. In recent weeks I posted two sets of comments on The End of Faith, his first book: The End of Faith: A Preview, and A Tree Died For This? A Tree Died For This? I sort of signed on to the Mind on Fire reading club project for The End of Faith: Religion, Terror, and the End of Reason, so now I have to say something nice about it ... no easy task. Here goes: I have learned, over the years, how to pick a good book. You get to know authors, you look for university presses, you check who endorses the book on the back cover, you note the author's tone and perspective in the Introduction, and so forth. I've gotten pretty good at it so I don't normally read bad books anymore. If you read nothing but good books, you recalibrate your expectations, forgetting how pathetic a badly written book can be. If you have fallen into this trap, you should read The End of Faith. It will remind you how badly a book can be written and still become popular. There's an online book group forming around The End of Faith: Religion, Terror, and the Future of Reason (WW Norton, 2004), so I thought I'd add it to my Featured Books queue and post early remarks, sort of an exercise in prereading. The author, according to the blurb on the back cover, is "now completing a doctorate in neuroscience, studying the neural basis of belief, disbelief, and uncertainty." Easy to sense the sort of presuppositions he brings to the inquiry: Science is good, religion is bad, and facts will conform to this view, or else. I just finished an enlightening journey through Victor Davis Hanson's A War Like No Other: How the Athenians and Spartans Fought the Peloponnesian War (Random House, 2005). Finally, a book that makes the war understandable. Really. I read the first 100 pages of Kagan's highly regarded one-volume work The Peloponnesian War (Viking, 2003), then gave up. The parties to the conflict all have three names, each has dozens of allies, the strategic aims of the whole affair are not immediately evident to the non-specialist, and the tactical goals of particular battles or skirmishes are even more obscure. It was like watching cricket: I know it's an athletic contest, but darned if I can figure out what they're doing running back and forth. Read A War Like No Other and you'll finally get it (the war, not cricket). Thank you, Mr. Hanson. [See Part 1] This is the second half of a review and summary of Storm From the East: The Struggle Between the Arab World and the Christian West (Modern Library, 2006), by Milton Viorst. As noted earler, this sort of review is worth conducting (at least for me) because what was once the Arab-Israeli conflict has broadened and intensified to become almost a simmering global conflict with no prospect of ending soon. And just because the West won the Cold War is no guarantee we'll win this one. This post covers events in the Middle East from WWII to the present. Section headings below are chapter titles from the book. Current events (the Israeli-Hezbollah War and the barely averted London airliner bombing plot) are reinforcing the view that the struggle of militant Islam against "the West", buttressed by a fundamentalist ideology under which militants claim the right to kill civilians as well as soldiers, is not going to go away anytime soon. This struggle is going to define at least the next two decades and maybe the next fifty years, so it's time to do a little homework: Storm from the East: The Stuggle Between the Arab World and the Christian West (Modern Library, 2006). The author, Milton Viorst, is a journalist (the dust jacket calls him a "journalist and scholar") who has covered the Middle East since the 1960s. I'll write a paragraph or two drawn directly from material in each chapter (my section headings are the chapter titles). If you like it, check the New Books shelf at your local library for a copy or buy it at Amazon. ... I first thought that Logan was a more or less typical small town. It was such a friendly place that we were soon drawn into its communal life. Yet as that happened, I began to sense that we had somehow wandered into a "twilight zone," that without realizing it we had become actors in one of Rod Serling's oft-used plots: a traveler has car trouble and is towed into what appears to be an ordinary small town for help that, inevitably, is long delayed, and, as time passes, the traveler begins to realize things in this particular small town are "ever so slightly different."